Jeane Westin talks with contributing editor Luan Gaines about the Virgin Queen's expectations for the women of her court, her lifelong bouts of illness and possible anorexia, and her fear of losing the love of her people - and with it her power. Interviewer Luan Gaines: What was your inspiration for The Virgin's Daughters ? What is the significance of the title? Elizabeth is inspiration enough for any historical author, but in this case I read that as queen she did not like for her ladies to marry and warned them against marriage. She wanted them to emulate her Virgin queen image and some did, but most did not. I wondered what that pressure was like for the women who served her and on Elizabeth herself. The title is significant in that it makes use of Elizabeth’s own conceit that her ladies were her “daughters” and she took a mother’s care of them. Many of the real mothers weren’t happy when Elizabeth wouldn’t allow their daughters advantageous marriages, which would permit them to rise in rank and wealth. Elizabeth Tudor is a fascinating figure in English history. At what point does Elizabeth realize that she must rule without a mate at her side? Is her embrace of an image as the Virgin Queen purely instinctive? Elizabeth realized at an early age that she didn’t want to marry, announcing it at eight years of age to Robert Dudley, later her Sweet Robin. Her father’s behavior toward his queens and other early traumatic life experiences confirmed her in her belief. I think she was afraid of marriage and, in particular, of childbirth. But most of all, she feared losing power, or being at the mercy of a husband. Her image as the Virgin Queen came about gradually and wasn’t generally used as an alternate name until she was older and no longer an object of marriage. The film Elizabeth, the Golden Age, while wonderfully acted and marvelous to view (if only for Kate Blanchett’s cheekbones), took liberties in indicating she deliberately imitated the Virgin Mary. It’s true that the Protestant English people who had formerly relied on the Virgin and all the Catholic saints needed a new figure to worship. And many did worship Elizabeth…she gave them opportunities to do so…but the name came about gradually and I don’t know that Elizabeth pushed that idea in the beginning, though I believe she did rather enjoy the image and enhance it later with her dress in virginal colors and in portraiture. What specific demand does Elizabeth make on her ladies-in-waiting? How does the conduct of her ladies-in-waiting project the queen’s image to the world? Is Elizabeth’s demand realistic? It was a common thought at that time that unmarried women were naturally immoral, so Elizabeth took pains to have no scandal attached to her court. In vain, I fear, because the old castles with their many dark corners were a caldron of sexual tension. You put together a thousand men and women and mix masques, dancing, alcohol and hide-and-go-seek, plus a few tickling games…and you tell me…what have you got? Her demand for a scandal-free court was unrealistic, but she had immense power and could demand it while not achieving it. Can you explain Katherine Grey’s relationship to Elizabeth? Why is Kate’s very existence a threat to Elizabeth’s reign? Henry VIII’s will named the Grey sisters, Jane (queen for nine days) and Kate to follow Elizabeth in line for the throne of England. They were cousins and therefore a threat to her. There were always schemers eager to supplant the ruler. So when Kate married Hertford, a nephew of Henry’s third Seymour queen, they made a powerful pair and had to be suppressed, their marriage and their two sons never legitimatized. In The Virgin's Daughters , you focus on Elizabeth’s two great romances during her reign, with Robert Dudley and the Earl of Essex. At the same time, a lady-in-waiting in each time frame has a conflict with the queen over the desire to marry. How do the queen’s romantic issues reflect her responses to Kate and Mary? How significant are these conflicts in your rendering of Elizabeth Tudor? I believe that the queen’s denial of Robert Dudley set her mind against Kate and Edward Seymour, though that mind-set was somewhat softened by the time Mary was one of her ladies, since there was no question of the queen marrying Essex. Elizabeth’s responses to the two ladies at the bookends of her life are very significant. The queen was a passionate woman, who loved the attention of handsome men, Robert Dudley, Christopher Hatton, Thomas Heneage, Walter Raleigh, Essex were her main attractions with many minor ones, but she never allowed herself to seriously consider marriage. She didn’t need to. She could command men’s constant attendance and adoration. Only at the end of her life did the extravagant talk of her beauty occasion snickers from courtiers waiting for her to die. Her court finally tired of her although we never shall. Why does Elizabeth refuse to share her throne with Robert Dudley? Would the public accept this man at Elizabeth’s side? Robert Dudley was hated during most of his lifetime. He was seen to have too much power and to be the son and grandson of traitors. He wasn’t trusted. When his wife Amy died mysteriously, after it was common knowledge that he and Elizabeth were in love, he was never considered completely innocent of her death. Amy obviously had advanced breast cancer, which today we know can cause bone fractures, but medicine at that time was primitive and had no such knowledge. A fall down stairs at Cumnor Manor could have broken her neck. Or she could have been in such pain, she committed suicide. A jury declared it “mischance”, the Tudor equivalent of accident. The family wanted to accept that verdict. Suicides at that time could not have a consecrated burial and were buried in the middle of a crossroads at night without benefit of clergy much like witches. Many at the time did not want to believe the jury’s decision and even implicated Elizabeth. After this mishap, marriage with Dudley would have been impossible and the queen knew it, though Dudley couldn’t accept it and tried for years to wed her. There is an interesting side theory that William Cecil, Elizabeth’s Secretary of State might have ordered her death to discredit Dudley and get rid of his influence. For all that he professes his eternal love, how much is known about Dudley’s motives in pursuing Elizabeth? As an author and researcher, what is your interpretation? There is evidence for every theory of that time or any other, but I believe that they were truly in love and that it lasted for their lifetimes. I explore this subject thoroughly in my next book, His Last Letter: Elizabeth I and the Earl of Leicester . What price does Kate pay for embracing her love for Edward Seymour in opposition to her queen? Do you consider this punishment extreme? She pays with the loss of Edward and her sons and eventually her banishment. Of course, today we would consider this punishment extreme, but at the time Kate had committed treason for disobeying the queen. Elizabeth thought Kate threatened her scepter and that was all the reason the queen needed to react harshly. Remember, Elizabeth could have ordered Kate’s execution. Having survived her tempestuous love affair with Dudley, once more the queen allows herself to be seduced by a charming man, this time when she is nearly forty years on the throne. How does Essex differ from Dudley? Does he harbor similar ambitions? Essex does harbor similar ambitions, the least of which was to be the power behind the throne. But Essex lacked Dudley’s real love for Elizabeth and his ability to know when to step back out of danger. In a way, Essex was a spoiled boy, who never grew up. How does Essex fall from grace? Is Elizabeth a fool in her affection for Essex? Again, much like Kate, he threatened her scepter, this time by raising rebellion. I think she would have forgiven him again, had he not made a very hurtful remark about her person. That was brutal and it hardened her heart against him. As I said, this story is not believable and I found no evidence for it. I believe Essex was dead from the moment he gave the lie to all the words of love he had showered on her. Elizabeth was foolish to want to believe in his love, but in the end was no fool for love. You include one of my favorite scenes in The Virgin's Daughters , Elizabeth’s confrontation with Essex when he enters her privy chamber demanding an audience. Afterward, she remarks, “He saw me like this?” Can you briefly describe this scene and explain the significance of this meeting? Elizabeth was wigged, heavily made-up, bejeweled and exquisitely gowned. She never allowed anyone to see her “in the flesh” or as anything but regal. By her late sixties, she was wrinkled, her eyes and cheeks sunken and her remaining hair white, not the picture of virginal and romantic fantasy she tried desperately to maintain. She had always enjoyed Essex’s boldness, but his breaking into her inner chamber in early morning went too far, especially after he had failed in Ireland by disobeying her orders. I loved that scene, too. The crux of The Virgin's Daughters is the drama between Elizabeth and two of her ladies, Kate and Mary, one early in her reign, the other much later. Both women remain loyal to their queen at the cost of happiness with the men they love. Why does Elizabeth persist in these battles with Kate and Mary? What is her deepest fear? For her first twenty-five years, Elizabeth is in danger of losing her life and her place in the succession. When she arrives on the throne, the country is broke, at war and in religious turmoil. Powerful men assume they will actually do the ruling and not this young woman. She quickly took over and shoved them aside. Some of them never got over her ascendancy and paid with their lives. After the early years of her life, any threat to her authority, whether from Kate, Mary or any of her ladies or courtiers, was not to be allowed. Her deepest fear was losing the love of her people and, with it, her power. You can judge her by her success: at the end of her reign of forty-five years, England had been transformed from a small island nation, struggling out of the Middle Ages into a world power with a world class navy. What is Mary Rogers’ relationship to Kate Grey? Is it Kate who inspires Mary to dream of being part of Elizabeth’s court? Considering their fates, did you find this a natural link between the two characters? In the book Kate and Mary are distant cousins. Yes, Kate inspired Mary, a young, impressionable girl living in the rural far west of England. Tales of being a lady at the court would have been to Mary very much like the pinnacle of rock star fame to us. Kate’s influence on Mary was a natural link for the book, tying the two stories together and explaining Mary’s desire to serve the queen. It also allowed me to show more about what happened to Kate. What did you find the most difficult in writing The Virgin's Daughters ? The most rewarding? The most difficult and most rewarding were actually the same: showing Elizabeth as a woman without being in her viewpoint. I found myself wanting to be inside her mind (and heart), but that was not the premise of the book. I’m able to satisfy this need in my next Tudor book, His Last Letter. History is rife with rumors about Elizabeth’s virginity, whether relinquished to Thomas Seymour or Robert Dudley, as well as the possibility that she may have had a child. In your research, what was the most shocking thing you learned about Elizabeth Tudor? As I said earlier, it was common for people to think unmarried women must be immoral. I don’t think that idea changed for a long time. Remember all the lascivious stories not too many decades ago about nurses and secretaries? I think she did have a passionate affair with Dudley when just coming to the throne, but I find the idea of the queen having a child not too believable. She was notoriously thin from eating “smally” all her life, in fact may have been anorexic. Hiding pregnancy from the court and not having the story leaked by one of her ladies would have been close to impossible. Believe me, they leaked almost everything. Cecil thought Dudley and Elizabeth were still lovers in 1572. To answer the second part of your question: the most shocking thing I found about Elizabeth was her lack of decisiveness. Her successes are so well known, that we don’t realize how difficult they were for her. She often dithered until the problem took care of itself, which only reinforced her desire to delay dangerous decisions. In addition, my research showed me how often she was very ill. Her body would swell and she would be unable to leave her bed for days. I think she had nervous breakdowns all her life, especially at her difficult moments after the Thomas Seymour “affair” and during some of her marriage negotiations, during Mary Stuart’s trial, after Dudley’s death, and many other times. It must have been difficult for her because she prided herself on her strength and stamina, insisting on long rides and walks even late in life when she must have pushed herself beyond her limit. On a more humorous note, what is Sir John Harington’s most memorable contribution to his country - one that continues to bear his name? I took a chance writing about the inventor of the first flush toilet or “john” because it is not a tasteful subject, but it was really too much fun not to deal with. It proved a perfect set-up to bring Mary and John together. After reading your novel, I found myself ambivalent about Elizabeth Tudor for the first time, especially her banishment of Kate Grey. Yet I found myself in tears at Elizabeth’s death. Is this the complex Elizabeth you hoped to portray in The Virgin's Daughters ? I hope you now understand the reasons behind Elizabeth’s behavior toward Kate. They were in keeping with the time, actually much less severe than her father’s or sister’s punishments, which could include burning at the stake for treason. I did want to show Elizabeth’s complexities, since that is part of her fascination for all of us. I’m able to show more of Elizabeth’s intricate nature in my next book which is in Elizabeth’s and Dudley’s viewpoints. Now that you have given us The Virgin's Daughters , are you working on another historical fiction project? If so, can you share something about it with us? Jeane Westin is the author of eight books. She lives in Sacramento, California. 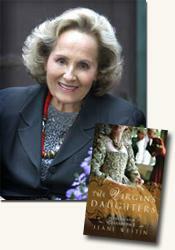 Contributing editor Luan Gaines interviewed author Jeane Westin, author of The Virgin's Daughters: In the Court of Elizabeth I (see accompanying review), about her book for curledup.com. Luan Gaines/2009.